Tanning magnates Guido Pfister and Frederick Vogel, Sr. migrated separately to the United States from the German Kingdom of Württemberg in the mid-1840s. Both worked briefly at the tannery of Vogel’s cousin in Buffalo, New York, before moving to Milwaukee in 1847. In Milwaukee, Pfister opened a leather retail store on Market Street Square and Vogel established a tannery on the Menomonee River. In June 1848, Pfister and Vogel merged their interests, forming G. Pfister & Company. While remaining in Buffalo, their former employer J.F. Schoelkoff invested capital and materials in the new Milwaukee operation. With this help and Pfister and Vogel’s experience, the new company quickly became the largest industrial tanning firm in Milwaukee. 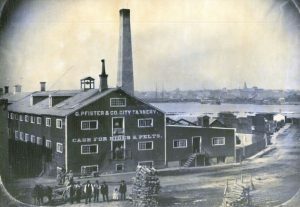 By the end of its first year, G. Pfister & Co. accounted for fifty percent of the leather produced in the city and was over seven times larger than its local competitors. By 1857, Schoelkoff was able to sell off his share of the enterprise for nearly four times his original investment. The firm reincorporated as the Pfister & Vogel Leather Company in 1872, with Pfister serving as president and Vogel as general manager. By this time the company had become “the largest tannery west of the Allegheny mountains.” New railroad connections improved the company’s access to raw materials and opened up new markets. At the same time, the introduction of mechanical and chemical innovations facilitated leather production on increasingly larger scales. 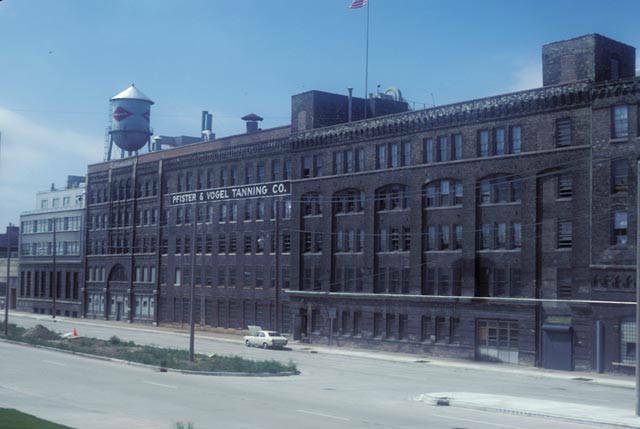 By the late 1890s, the company had expanded Vogel’s original tannery along the Menomonee River into a sprawling industrial complex in Milwaukee’s Walker’s Point as well as smaller plants elsewhere in Milwaukee and in Cheboygan, Michigan. The number of workers swelled from 60 in 1860 to nearly 500 by the mid-1880s and over 750 by the mid-1890s. Although Pfister & Vogel manufactured an array of leathers from different hides throughout its history, the company focused primarily on the production of plain cowhide as well as calf and kipskin leather, materials used by other manufacturers to make finished products. By the late 1910s, Pfister & Vogel was one of the largest tanners in the world. Industry demands during World War I helped Pfister & Vogel expand its workforce to over 3,500 workers. The company peaked, however, in 1919. High prices generated by wartime demand, the introduction of cheaper synthetic materials, decreased daily use of common leather goods, and increased competition from foreign producers drastically reduced the company’s sales and initiated a precipitous decline. In December 1930, Pfister & Vogel scaled down its tanning operations to its Pleasant Street plant. The company again devoted much of its production to the military during the Second World War. In the following decades, it continued to adopt innovations that allowed it to manufacture more leather with a smaller workforce. The company changed hands numerous times after the 1960s. Finally, in 1988, it was acquired by the U.S. Leather Company to make leather for the auto industry. This company’s last Milwaukee facility closed in 2000. Several of the old Pfister & Vogel factory sites have been remediated and redeveloped into condominiums, artist studios, and retail spaces. ^ Anthony M. Orum, City-Building in America (Boulder, CO: Westview Press, 1995), 52. ^ John G. Gregory, History of Milwaukee, Wisconsin, vol. 1 (Chicago and Milwaukee: S.J. Clarke Publishing, 1931), 536; Bayrd Still, Milwaukee: The History of a City (Madison: State Historical Society of Wisconsin, 1948), 187-188; John Gurda, The Making of Milwaukee (Milwaukee: Milwaukee County Historical Society, 1999), 119; Kathleen Neils Conzen, Immigrant Milwaukee, 1836-1860: Accommodation and Community in a Frontier City (Cambridge, MA: Harvard University Press, 1976), 105; Margaret Walsh, The Manufacturing Frontier: Pioneer Industry in Antebellum Wisconsin 1830-1860 (Madison: State Historical Society of Wisconsin, 1972), 189-190; Charles Ernest Schefft, “The Tanning Industry in Wisconsin: A History of Its Frontier Origins and Its Development” (Master’s Thesis, University of Wisconsin, 1938), 24-25. ^ To Commemorate 100 Years of Service (Milwaukee: Pfister & Vogel Tanning Company, 1948), 3; Herbert W. Rice, “Pioneer in Leather,” Historical Messenger of the Milwaukee County Historical Society 11, no. 1 (March 1955): 9; Conzen, Immigrant Milwaukee, 105-106. ^ Walsh, Manufacturing Frontier, 190; Conzen, Immigrant Milwaukee, 105-106. ^ Walsh, Manufacturing Frontier, 189; Conzen, Immigrant Milwaukee, 105-106. ^ 100 Years of Service, 8; Rice, “Pioneer in Leather,” 9. ^ Walsh, Manufacturing Frontier, 190-191; Schefft, “The Tanning Industry in Wisconsin,” 56-59. ^ Walsh, Manufacturing Frontier, 190; Milwaukee Grain & Stock Exchange, Thirtieth Annual Report of the Milwaukee Grain & Stock Exchange (Milwaukee: King, Fowle & Co., 1888), 178; 100 Years of Service, 8-9; Orum, City-Building in America, 52; Schefft, “The Tanning Industry in Wisconsin,” 76. ^ Conzen, Immigrant Milwaukee, 105-106. ^ 100 Years of Service, 9-11; Milwaukee Grain & Stock Exchange, Thirty-First Annual Report of the Milwaukee Grain & Stock Exchange (Milwaukee: Cramer, Aikens & Cramer, 1889), 178. ^ 100 Years of Service, 9; John Gurda, Cream City Chronicles: Stories of Milwaukee’s Past (Madison, WI: Wisconsin Historical Society Press, 2014), 128. ^ 100 Years of Service, 11. ^ Schefft, “The Tanning Industry in Wisconsin,” 88-89; Gregory, History of Milwaukee, Wisconsin, 1:537-538; Still, Milwaukee, 495; Gurda, Making of Milwaukee, 241; 100 Years of Service, 11-12. ^ 100 Years of Service, 12-13. ^ 100 Years of Service, 14-16; “State’s Leather Industry Owes Start to Pfister & Vogel, Now in 100th Year,” Milwaukee Sentinel, August 15, 1948, sec. B, p. 6. ^ “Tannery’s Recent History Was Marked by Upheaval,” Milwaukee Journal Sentinel, February 5, 2000, 3D; Joel Dresang, “U.S. Leather to End All Business in Milwaukee; 600 Jobs Lost,” Milwaukee Journal Sentinel, February 2, 2000, 8B. ^ EPA Brownfields and Land Revitalization Program, Pfister & Vogel Tannery: Transforming Milwaukee’s Largest Brownfield into a Sustainable Benefit for the Community (Chicago, IL: Region 5, United States Environmental Protection Agency, July 2010); The Tannery website, accessed November 20, 2014; Interim Historic Designation Study Report: Herman Zohrlaut Leather Company, Pfister & Vogel Tanning Company Complex (Milwaukee: City of Milwaukee, Department of City Development, November 2001). Pfister & Vogel Tanning Company, To Commemorate 100 Years of Service. Milwaukee: Pfister & Vogel Tanning Company, 1948. Schefft, Charles Ernest. “The Tanning Industry in Wisconsin: A History of its Frontier Origins and its Development.” M.A. thesis, University of Wisconsin, 1938.